The domestic goat (Capra aegagrus hircus) is a subspecies of goat domesticated from the wild of southwest Asia and Eastern Europe. The goat is a member of the family Bovidae and is closely related to the sheep as both are in the goat-antelope subfamily Caprinae. There are over 300 distinct breeds of goat. Goats are one of the oldest domesticated species, and have been used for their milk, meat, hair, and skins in all parts of the world. Female goats are referred to as "does" or "nannies", while males are known as "bucks" or "billies", and their offspring are "kids". Castrated males are "wethers". Goats are considered small livestock animals; compared to bigger animals such as cattle, camels and horses. Most goats naturally have two horns, of various shapes and sizes depending on the breed. They are ruminant animals with four chambered stomach. The females have an udder consisting of two teats, in contrast to cattle, which have four teats. Both male and female goats have beards, and many types of goat (most commonly dairy goats and dairy-cross Boers) may have wattles, one dangling from each side of the neck. Goats are renowned for their hardiness and ability to survive in most environments. Life expectancy for goats is between fifteen and eighteen years. An instance of a goat reaching the age of 24 has been reported. Several factors can reduce this average expectancy; problems during kidding can lower a doe's expected life span to ten or eleven, and stresses of going into rut can lower a buck's expected life span to eight to ten years. Other factors that could reduce the life span of Goat are; attack from diseases, predators and ecological factors. 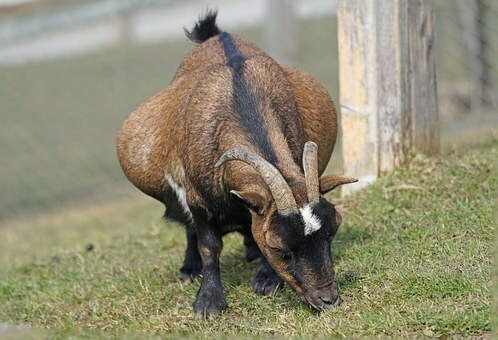 The West African Dwarf Goats are kept in the forest zones and in the Middle Belt; Sokoto Reds are kept throughout the north; and Sahel goats are restricted to a strip along the frontier with the Niger. Although pastoral Sahel goats are found in the northern semi-arid zone, most goats are kept in villages. The most common production system is that of seasonal confinement. Northern goats were found to be markedly more productive than West African Dwarf goats, with lower ages at first kidding and shorter kidding intervals, although they produced fewer kids per kidding. Setting up a herd, male animals of above one year of age with wide deep chest, well-sprung ribs, and strong hindquarters are mostly preferred. A buck can serve 20 does. A doe should have at least two pairs of teats. When freshly purchased animals are brought into a flock, a quarantine period of 30 days should be observed as this gives ample time for observation of attack by any disease. Animals of about 15 months of age or 12 kg (about half weight of bag of livestock feed) should be purchased. They should be bought from the villages rather than the market so as to avoid the incidence of purchasing disease prone animals from the market. The Animals are dipped in gammatex solution. The animals should also be administered with triple sulphonamide, like theracazan. On the first day of arrival in the farm, they should be immunized with rinderpest hyper-immune serum followed by vaccination with tissue culture rinderpest vaccine (TCRV). They should also be treated with broad-spectrum anthelmintic e.g., thiabendazole on the 3rd and 24th days of arrival.. In the absence of veterinary drugs, newly purchased animals should be watched closely. If there are signs of disease, such animals should be temporarily culled. If the disease persists the animals should be disposed off. Goats are useful to humans when they are living and when they are dead. Both as a renewable provider of milk, manure, and fiber, and then as meat and hide. Because Goats are easier and cheaper to manage than other livestock, it becomes an interesting venture for one to look into. In some countries, the horns of Goats are used to make spoons and their intestines are used for musical instruments. According to the FAO, the top producers of goat meat in 2008 were China (1.83 million metric tons), India (0.48 million metric tons) and Nigeria (o.26 million metric tons). It is usually better to start a livestock farm during the dry season, as many diseases common with Goats are more prevalent during the wet season. · Viruses: foot-and-mouth disease, bluetongue disease, maedi-visna, orf, tick-borne encephalomyelitis, peste-des-petits-ruminants virus and goatpox. · Bacteria: blackleg, foot rot, caprine pleuropneumonia and chlamydiosis. The services of a good veterinarian are employed in treating these diseases. In conclusion, although a number of people have been suggesting a more intensive production approach to small ruminant development in Nigeria, the initial capital investment and management constraints associated with such a venture may make the programme unattractive. In the interim, improvement of the existing systems should be the main focus, until technology is ready for intensive production systems. The importance of small ruminants in the life of the people cannot be overemphasized. The Government is quite aware of this development, and as a result, priority is being accorded to sheep and goat production development in the Fifth National Development Plan. Goats reach puberty between 3 and 15 months of age, depending on breed and nutritional status. Many breeders prefer to postpone breeding until the doe has reached 70% of the adult weight. However, this separation is rarely possible in extensively managed, open-range herds. In most regions, goats are able to breed at any time of the year. Successful breeding in these regions depends more on available forage. Does of any breed or region come into estrus (heat) every 21 days for 2 to 48 hours. A doe in heat typically flags (vigorously wags) her tail often, stays near the buck if one is present, becomes more vocal, and may also show a decrease in appetite and milk production for the duration of the heat. In addition to natural mating, artificial insemination has gained popularity among goat breeders, as it allows easy access to a wide variety of bloodlines. Gestation length is approximately 150 days. They usually bear twins or most times triplet, even quadruplets are possible. Less frequent are litters of quadruplet, quintuplet, and even sextuplet kids. Birthing, known as kidding, generally occurs uneventfully. Just before kidding, the doe will have a sunken area around the tail and hip, as well as heavy breathing. She may have a worried look, become restless and display great affection for her keeper. The mother often eats the placenta, which gives her much-needed nutrients, helps stanch her bleeding, and parallels the behavior of wild herbivores, such as deer, to reduce the lure of the birth scent for predators. Goats are reputed to be willing to eat almost anything, including cans and cardboard boxes. While goats will not actually eat inedible material, they are browsing animals, not grazers like cattle and sheep, and (coupled with their natural curiosity and intelligence) will chew on and taste just about anything resembling plant matter to decide whether it is good to eat, including cardboard and paper labels from cans. Another possibility is goats are curious about the unusual smells of leftover food in discarded cans or boxes. Husbandry, or animal care and use, varies by region and culture. The particular housing used for goats depends not only on the intended use of the goat, but also on the region of the world where they are raised. Historically, domestic goats were generally kept in herds that wandered on hills or other grazing areas, often tended by goatherds who were frequently children or adolescents, similar to the more widely known shepherd. These methods of herding are still used today. In Africa and the Mideast, goats are typically run in flocks with sheep. This maximizes the production per acre, as goats and sheep prefer different food plants. Multiple types of goat-raising are found in Ethiopia, where four main types have been identified: pastured in annual crop systems, in perennial crop systems, with cattle, and in arid areas, under pastoral (nomadic) herding systems. In all four systems, however, goats were typically kept in extensive systems, with few purchased inputs. Household goats are traditionally kept in Nigeria. While many goats are allowed to wander the homestead or village, others are kept penned and fed in what is called a 'cut-and-carry' system, which refers to the practice of cutting down grasses, corn or cane for feed rather than allowing the animal access to the field, is particularly suited for types of feed, such as corn or cane, that are easily destroyed by trampling. As of 2010 goat was the most widely consumed red meat, eaten by more than 70% of the world's population. It is a staple of Africa, Asia and South/Central America, and a delicacy in a few European cuisines. It can be prepared in a variety of ways, including stewing, baking, grilling, barbecuing, canning, and frying; it can be minced, curried, or made into sausage. Due to its low fat content, the meat can toughen at high temperatures if cooked without additional moisture. Goats produce about 2% of the world's total annual milk supply. Goat milk naturally has small, well-emulsified fat globules, which means the cream remains suspended in the milk, instead of rising to the top, as in raw cow milk; therefore, it does not need to be homogenized. Goat milk can also be commonly processed into cheese, butter, ice cream, yogurt, and other products. Goat butter is white because goats produce milk with the yellow beta-carotene converted to a colorless form of vitamin A.